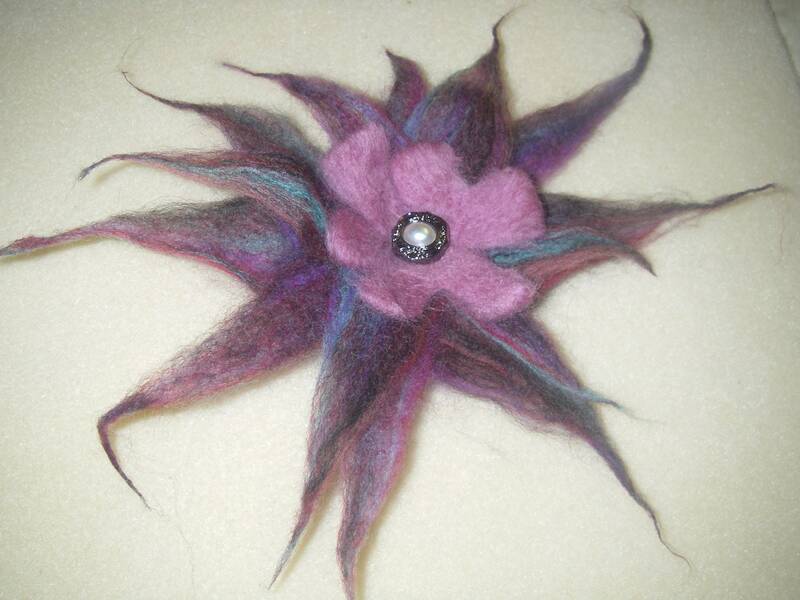 Beautiful brooch, delicately needle felted by hand. I carefully blended super soft merino wool tops in a range of complimentary pinks, blues and purples to produce a muli-tonal effect. The petals were formed in pairs then moulded and fused together to form a completely unique, OOAK, flower. The flower is finished off with a pearl button centre and a brooch pin on the back. The brooch fastener can be swapped for a multiclip allowing you to wear this flower as a hair accessory or brooch. Similar items can be crafted to order in a range of sizes, colours and styles. Pink Flower - Brooch on Flickr - Photo Sharing! Red felted flower- Brooch on Flickr - Photo Sharing!